You come home from a contentious day at work. You're tense, and a big lunch has left you slightly dyspeptic; some instant exercise and a massage might release that tension and improve your metabolism. With microprocessors and sensors converting professional physical fitness equipment into consumer items, it's possible to turn a room in your home into a miniature health club (Fig. 11. To be sure, such equipment is not for everyone. Prices alone, ranging from hundreds of dollars to the low thousands, could trigger arrhythmia in some people. But if you can afford them and a doctor or trainer has told you how to use them to your advantage, an array of high-tech bicycle exercisers, rowing machines, and strength-training equipment is available-not to mention such personal health devices as electronic blood pressure monitors, muscle massagers, and biofeedback units. You enter the exercise room, seat yourself on a stationary bicycle, and start pedaling. A small optical sensor clipped to your finger picks-up your pulse rate. Displayed on a small LED attached to the handlebars is the speed at which you are pedaling and the number of calories burned. You shower, but a slight cramp you developed in one calf while cycling hasn't let up. Now you can apply that ultrasonic massager that may have seemed so extravagent. Soon the muscle relaxes. Still, there is residual tension from the day's work. Why not go for the full treatment? Stretching into a rdclining chair, you place a headset over your ears and grasp a small biofeedback hand-piece. The loud tone in the headset indicates emotional tension. Relax your facial muscles. The tone diminishes, and the quieter it becomes, the more you relax. Finally the tone disappears. You are beginning to feel comfortable and can finally start thinking about dinner. What has changed in home exercise equipment that makes it so appealing? Manufacturers and sellers cite these features: It is more compact and is designed to blend in nicely with the furnishings in one room of a house or apartment. It is more versatile; one unit can perform many functions. And it is relying more on electronics to give fast feedback to users. The industry is growing; the National Sporting Goods Association says $960 million was spent on home gym equipment in the United States in 1983. 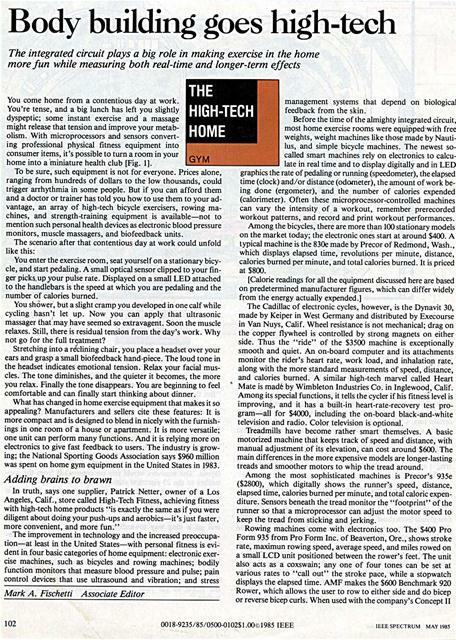 In truth, says one supplier, Patrick Netter, owner of a Los Angeles, Calif., store called High-Tech Fitness, achieving fitness with high-tech home products "is exactly the same as if you were diligent about doing your push-ups and aerobics-it's just faster, more convenient, and more fun." late in real time and to display digitally and in LED graphics the rate of pedaling or running (speedometer), the elapsed time (clock) and/or distance (odometer), the amount of work being done (ergometer), and the number of calories expended (calorimeter). Often these microprocessor-controlled machines can vary the intensity of a workout, remember prerecorded workout patterns, and record and print workout performances. Among the bicycles, there are more than 100 stationary models on the market today; the electronic ones start at around $400. A typical machine is the 830e made by Precor of Redmond, Wash., which displays elapsed time, revolutions per minute, distance, calories burned per minute, and total calories burned. It is priced at $800. The Cadillac of electronic cycles, however, is the Dynavit 30, made by Keiper in West Germany and distributed by Execourse in Van Nuys, Calif. Wheel resistance is not mechanical; drag on the copper flywheel is controlled by strong magnets on either side. Thus the "ride" of the $3500 machine is exceptionally smooth and quiet. An on-board computer and its attachments monitor the rider's heart rate, work load, and inhalation rate, along with the more standard measurements of speed, distance, and calories burned. 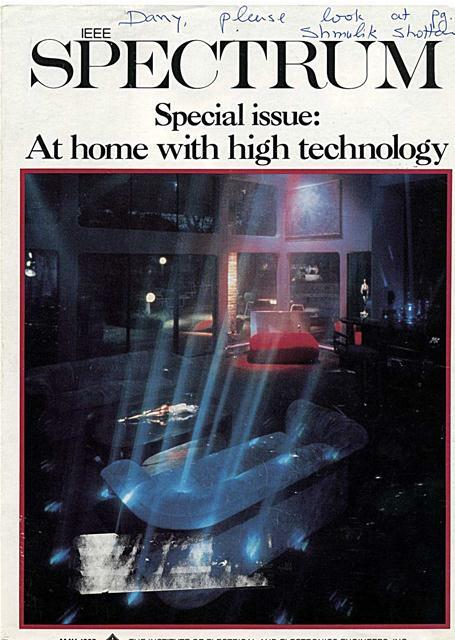 A similar high-tech marvel called Heart Mate is made by Wimbleton Industries Co. in Inglewood, Calif. Among its special functions, it tells the cycler if his fitness level is improving, and it has a built-in heart-rate-recovery test program-all for $4000, including the on-board black-and-white television and radio. Color television is optional. Treadmills have become rather smart themselves. A basic motorized machine that keeps track of speed and distance, with manual adjustment of its elevation, can cost around $600. The main differences in the more expensive models are longer-lasting treads and smoother motors to whip the tread around. Among the most sophisticated machines is Precor's 935e ($2800), which digitally shows the runner's speed, distance, elapsed time, calories burned per minute, and total caloric expenditure. Sensors beneath the tread monitor the "footprint" of the runner so that a microprocessor can adjust the motor speed to keep the tread from sticking and jerking. ergometer, it can be attached to a home computer so the exerciser can race pace boats on the computer screen. If money is no object but completely computerized exercising is, two machines are eye-catchers: the Selectronic 2100, a weightlifting system made by Questar in Cedar Rapids, Iowa, and the Ariel 4000 computerized exercise machine from the Coto Research Center in Trabuco Canyon, Calif.
With the Selectronic 2100, there is no iron to pump; the machine uses water instead as the weight medium. Built to resemble a universal weight machine (a metal latticework that has several weight stations), it uses four vertical cylinders containing water, in which pistons pump in and out to vary resistance from 0 to 360 pounds. This means the user can adjust the resistance during any single exercise repetition. A hand-held switch, much like an automatic television control, activitates the pumps and valves. The hydraulic system runs on standard I 10-volt, 60-hertz house current. The entire machine and routines are programmed on a computer that is an optional part of the package from Questar; the company offers software that is also compatible with many personal computers. The machine costs about $5000. The software starts at $500; the computer and the most complete software add $4000 to the cost of the machine. The Ariel 4000 was developed by Gideon Ariel, an athletic biomechanics pioneer and president of the Coto Research Center, to train Olympic athletes. At $13 000, the system is obviously for the discriminating buyer. The hydraulic machine, sold by Ariel Dynamics Inc. in Trabuco Canyon, is controlled directly by an attached computer system [Fig. 2]. A personal fitness program disk instructs the computer to tailor the speed, resistance, and range of motion for each exercise, based on past performance and on diagnostics programmed when the exerciser first uses the system. For each exercise repetition, the "weight" moved and the force, speed, work done, and calories burned are displayed on a color graphics monitor. As an option, there is even a Pac Man-like character that eats cheesecake-the harder you work, the faster it eats. These graphics, plus numerical readings across the entire workout, can also be printed on a color printer. Variable resistance, rather than the fixed resistance or feedback-controlled resistance of other weight machines, is used to improve the efficiency with which muscles work in using the Ariel 4000; each part of each muscle is more fully taxed during each portion of a repeated movement. This is possible because the resistance, force levels, speed, and temporal sequence during each repetition are all varied in real time by the computer, based on past performance and desired performance. Because these parameters are stored, each exercise can be made harder for the next workout, or reprogrammed to individual strengths and weaknesses. Strength, speed, and endurance can be compared with the performance of top world athletes, displayed on the monitor as the workout progresses. ]Sharon M. Rosenberg, owner of several manufacturing firms, wanted a hightech fitness room minus the gymnasium look in her Los Angeles home. 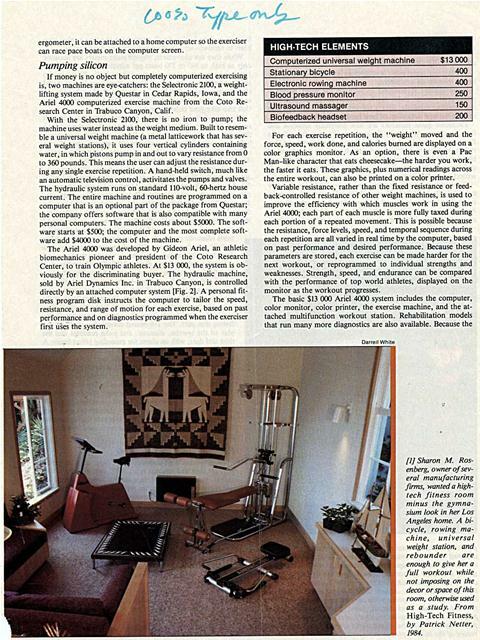 A bicycle, rowing machine, universal weight station, and rebounder are enough to give her a full workout while not imposing on the decor or space of this room, otherwise used as a study. 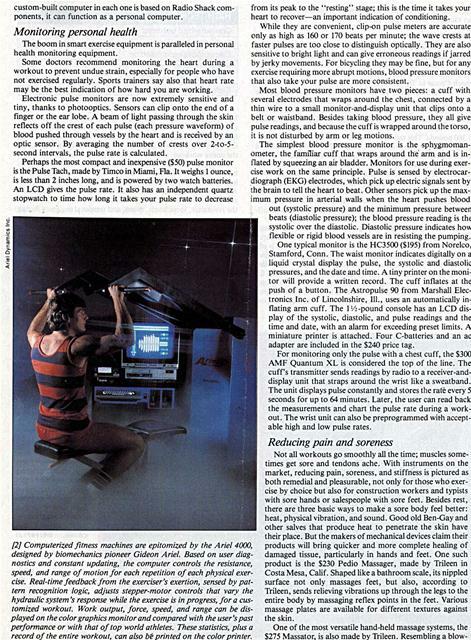 From High-Tech Fitness, by Patrick Netter, 1984.
custom-built computer in each one is based on Radio Shack components, it can function as a personal computer. The boom in smart exercise equipment is paralleled in personal health monitoring equipment. Some doctors recommend monitoring the heart during a workout to prevent undue strain, especially for people who have not exercised regularly. Sports trainers say also that heart rate may be the best indication of how hard you are working. Electronic pulse monitors are now extremely sensitive and tiny, thanks to photooptics. Sensors can clip onto the end of a finger or the ear lobe. A beam of light passing through the skin reflects off the crest of each pulse (each pressure waveform) of blood pushed through vessels by the heart and is received by an optic sensor. By averaging the number of crests over 2-to-5second intervals, the pulse rate is calculated. from its peak to the "resting" stage; this is the time it takes your heart to recover-an important indication of conditioning. While they are convenient, clip-on pulse meters are accurate only as high as 160 or 170 beats per minute; the wave crests at faster pulses are too close to distinguish optically. They are also sensitive to bright light and can give erroneous readings if jarred by jerky movements. For bicycling they may be fine, but for any exercise requiring more abrupt motions, blood pressure monitors that also take your pulse are more consistent. Most blood pressure monitors have two pieces: a cuff with several electrodes that wraps around the chest, connected by a thin wire to a small monitor-and-display unit that clips onto a belt or waistband. Besides taking blood pressure, they all give pulse readings, and because the cuff is wrapped around the torso, it is not disturbed by arm or leg motions. flexible or rigid blood vessels are in resisting the pumping. One typical monitor is the HC3500 ($195) from Norelco, Stamford, Conn. The waist monitor indicates digitally on a liquid crystal display the pulse, the systolic and diastolic pressures, and the date and time. A tiny printer on the monitor will provide a written record. The cuff inflates at the push of a button. The Astropulse 90 from Marshall Electronics Inc. of Lincolnshire, Ill., uses an automatically inflating arm cuff. The I '/.,-pound console has an LCD display of the systolic, diastolic, and pulse readings and the time and date, with an alarm for exceeding preset limits. A miniature printer is attached. Four C-batteries and an ac adapter are included in the $240 price tag. -	able high and low pulse rates. 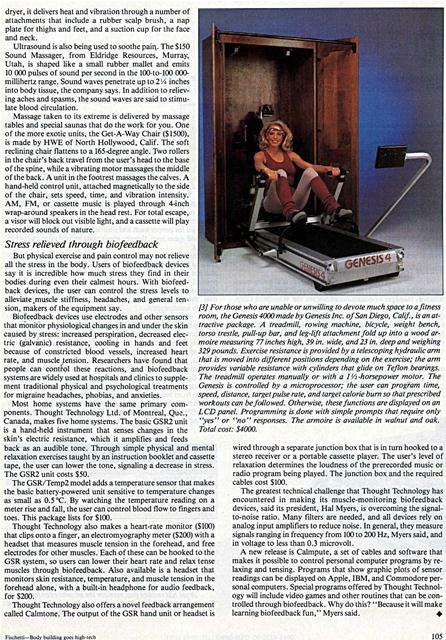 Computerized fitness machines are epitomized by the Ariel 4000, designed by biomechanics pioneer Gideon Ariel. Based on user diagnostics and constant updating, the computer controls the resistance, speed, and range of motion for each repetition of each physical exercise. Real-time feedback from the exerciser's exertion, sensed by pattern recognition logic, adjusts stepper-motor controls that vary the hydraulic system's response while the exercise is in progress, for a customized workout. Work output, force, speed, and range can be displayed on the color graphics monitor and compared with the user's past performance or with that of top world athletes. These statistics, plus a record of the entire workout, can also be printed on the color printer. Not all workouts go smoothly all the time; muscles sometimes get sore and tendons ache. With instruments on the market, reducing pain, soreness, and stiffness is pictured as both remedial and pleasurable, not only for those who exercise by choice but also for construction workers and typists with sore hands or salespeople with sore feet. Besides rest, there are three basic ways to make a sore body feel better: heat, physical vibration, and sound. Good old Ben-Gay and other salves that produce heat to penetrate the skin have their place. But the makers of mechanical devices claim their products will bring quicker and more complete healing of damaged tissue, particularly in hands and feet. One such product is the $230 Pedio Massager, made by Trileen in Costa Mesa, Calif. Shaped like a bathroom scale, its nippled surface not only massages feet, but also, according to Trileen, sends relieving vibrations up through the legs to the entire body by massaging reflex points in the feet. Various massage plates are available for different textures against the skin. dryer, it delivers heat and vibration through a number of attachments that include a rubber scalp brush, a nap plate for thighs and feet, and a suction cup for the face and neck. Ultrasound is also being used to soothe paiq. The $150 Sound Massager, from Eldridge Resources, Murray, Utah, is shaped like a small rubber mallet and emits 10 000 pulses of sound per second in the 100-to-100 000millihertz range. Sound waves penetrate up to 2'/4 inches into body tissue, the company says. In addition to relieving aches and spasms, the sound waves are said to stimulate blood circulation. Massage taken to its extreme is delivered by massage tables and special saunas that do the work for you. One of the more exotic units, the Get-A-Way Chair ($1500), is made by HWE of North Hollywood, Calif. The soft reclining chair flattens to a 165-degree angle. Two rollers in the chair's back travel from the user's head to the base of the spine, while a vibrating motor massages the middle of the back. A unit in the footrest massages the calves. A hand-held control unit, attached magnetically to the side of the chair, sets speed, time, and vibration intensity. AM, FM, or cassette music is played through 4-inch wrap-around speakers in the head rest. For total escape, a visor will block out visible light, and a cassette will play recorded sounds of nature. But physical exercise and pain control may not relieve all the stress in the body. Users of biofeedback devices say it is incredible how much stress they find in their bodies during even their calmest hours. With biofeedback devices, the user can control the stress levels to alleviate muscle stiffness, headaches, and general tension, makers of the equipment say. Biofeedback devices use electrodes and other sensors that monitor physiological changes in and under the skin caused by stress: increased perspiration, decreased electric (galvanic) resistance, cooling in hands and feet because of constricted blood vessels, increased heart rate, and muscle tension. Researchers have found that people can control these reactions, and biofeedback systems are widely used at hospitals and clinics to supplement traditional physical and psychological treatments for migraine headaches, phobias, and anxieties. back as an audible tone. Through simple physical and mental relaxation exercises taught by an instruction booklet and cassette tape, the user can lower the tone, signaling a decrease in stress. The GSR2 unit costs $50. The GSR/Temp2 model adds a temperature sensor that makes the basic battery-powered unit sensitive to temperature changes as small as 0.5'C. By watching the temperature reading on a meter rise and fall, the user can control blood flow to fingers and toes. This package lists for $100. Thought Technology also makes a heart-rate monitor ($100) that clips onto a finger, an electromyography meter ($200) with a headset that measures muscle tension in the forehead, and free electrodes for other muscles. Each of these can be hooked to the GSR system, so users can lower their heart rate and relax tense muscles through biofeedback. Also available is a headset that monitors skin resistance, temperature, and muscle tension in the forehead alone, with a built-in headphone for audio feedback, for $200. wired through a separate junction box that is in turn hooked to a stereo receiver or a portable cassette player. The user's level of relaxation determines the loudness of the prerecorded music or radio program being played. The junction box and the required cables cost $100. The greatest technical challenge that Thought Technology has encountered in making its muscle-monitoring biofeedback devices, said its president, Hal Myers, is overcoming the signalto-noise ratio. Many filters are needed, and all devices rely on analog input amplifiers to reduce noise. In general, they measure signals ranging in frequency from 100 to 200 Hz, Myers said, and in voltage to less than 0.3 microvolt. A new release is Calmpute, a set of cables and software that makes it possible to control personal computer programs by relaxing and tensing. Programs that show graphic plots of sensor readings can be displayed on Apple, IBM, and Commodore personal computers. Special programs offered by Thought Technology will include video games and other routines that can be controlled through biofeedback. Why do this? "Because it will make learning biofeedback fun," Myers said. (31 For those who are unable or unwilling to devote much space to a fitness room, the Genesis 4000 made by Genesis Inc. of San Diego, Calif., is an attractive package. A treadmill, rowing machine, bicycle, weight bench, torso trestle, pull-up bar, and leg-lift attachment fold up into a wood armoire measuring 77 inches high, 39 in. wide, and 23 in. deep and weighing 329 pounds. Exercise resistance is provided by a telescoping hydraulic arm that is moved into different positions depending on the exercise; the arm provides variable resistance with cylinders that glide on Teflon bearings. The treadmill operates manually or with a PI-horsepower motor. The Genesis is controlled by a microprocessor; the user can program time, speed, distance, target pulse rate, and target calorie burn so that prescribed workouts can be followed. Otherwise, these functions are displayed on an LCD panel. Programming is done with simple prompts that require only "yes" or "no" responses. The armoire is available in walnut and oak. Total cost: $4000. Generated on 4/20/2019 4:02:31 PM (PST) ADI/HQ/GBA/2019/ARIELCLOUD/v3.0.2018.0126.